Josh Mullin levelled in stoppage-time. 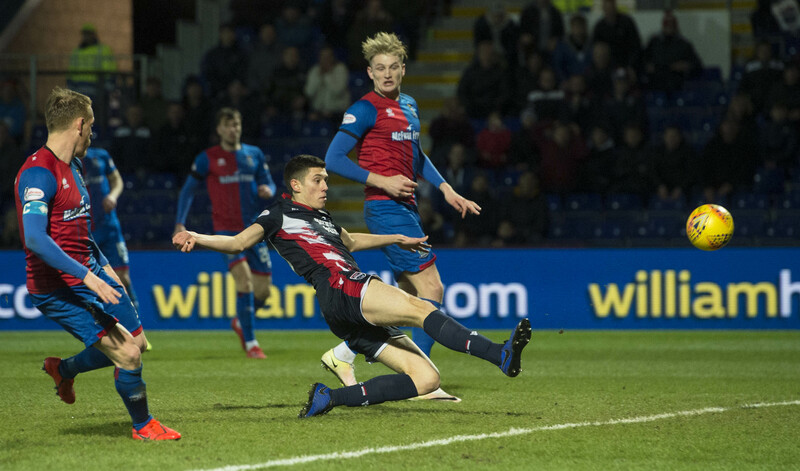 Josh Mullin kept Ross County in the Scottish Cup with a late equaliser to deny Caley Thistle. Mullin struck in stoppage-time, just as it looked like Brad Mckay’s goal was enough to put Caley Thistle in the draw for the last eight. Aaron Doran had given Inverness the lead in the first before substitute Ross Stewart levelled in the second half. The two teams will do it all again at the Caledonian Stadium on February 19, for a place in the quarter-finals. County made two changes from the 2-1 win over Dunfermline Athletic, with Michael Gardyne and Andy Boyle into the side for Declan McManus and Callum Semple. John Robertson drafted in five players after the 2-1 defeat to Partick Thistle, with Mark Ridgers, Carl Tremarco, Coll Donaldson, Tom Walsh and Doran for Cammy Mackay, Shaun Rooney, Nathan Austin, Darren McCauley and Anthony McDonald. Walsh was making his first start since the 1-0 win over Ayr United last month, while Ridgers had overcome a back problem that had sidelined him since the draw at Falkirk. The home side had two great chances in the opening 10 minutes, with Billy Mckay firing over when the ball sat up nicely for him and Jamie Lindsay skewing wide, when he was unmarked from a County corner. Following a Joe Chalmers free-kick that Scott Fox parried, Inverness went one better on 14 minutes to take the lead. A County clearance was nodded forward by Tremarco into Doran’s path and on the turn, he rattled in a sweet half-volley that beat Fox from the edge of the box. It was his sixth career goal against their Highland rivals. Aaron Doran celebrates with Coll Donaldson after giving Caley Thistle the lead. 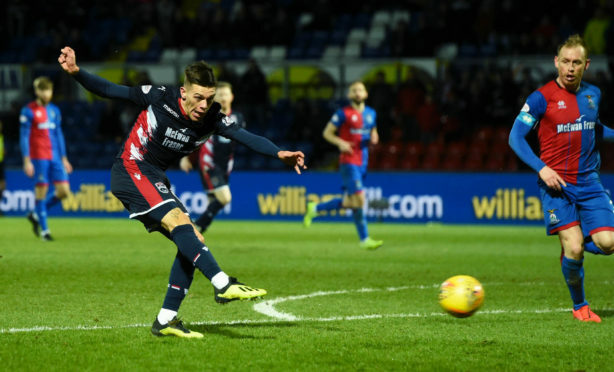 Gardyne had the best chance to level for the Staggies, advancing on to Ross Draper’s pass in the box but his shot deflected wide of the target, just as it appeared to be opening up for him. The experienced winger was getting closer, as he was denied by Ridgers on the half-hour mark when he latched on to Brian Graham’s header. Caley Thistle countered immediately through Doran, as he teed up Polworth and then Tom Walsh, with Fox clawing the ball away from the far corner. The final chances of the first period both went to Walsh, who was beaten to a Doran through ball by Fox and saw a goal-bound volley blocked by Kenny van der Weg. Inverness started the second half brightly and Fox was called into action five minutes in, repelling a low drive from Tremarco with his legs. Stewart had only been on the pitch a minute when he made his impact. Gardyne had been given space down the left and delivered a near-post cross, with Stewart on hand to volley in from close-range. The equaliser opened the game up with chances at both ends, as Doran nicked a header from Jordan White from Sean Welsh’s cross, which went wide, and Lewis Spence angled a ball across the face of goal that went unrewarded. Ross County’s Ross Stewart scores to make it 1-1. Inverness restored their lead with 25 minutes to go, with Polworth’s corner evading everyone until it reached Mckay at the back post, with the defender able to take a touch before rifling into the roof of the net. 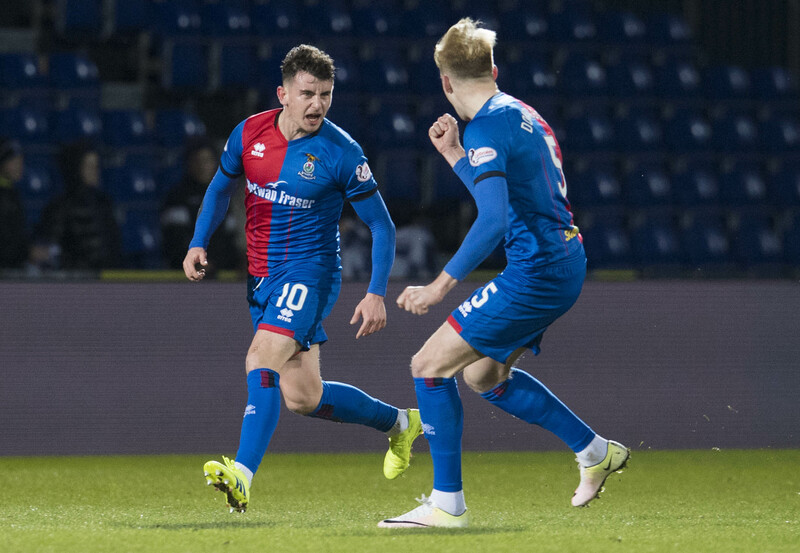 The hosts very nearly gifted the Caley Jags a third with 10 minutes to go, as Marcus Fraser and Jamie Lindsay got caught up with each other, allowing Walsh to break free. Lindsay kept pace with Walsh but he got a shot away, which Fox tipped over. A place in the last eight looked to have passed County by but Mullin delivered in stoppage-time, driving through Ridgers’ legs to level.